Like many of you folks, I have a pile of VHS tapes lying around, movies, family events, that episode of the X-Files I had to tape because a server crashed. I also have a DVD player and have seen the writing on the wall. VHS is dead, long live DVD. I have been considering alternatives for converting all those tapes and haven't been too excited. With Belkin's DVD Creator there is now another option. The unit supports NTSC, PAL and SECAM video inputs and both composite and S- Video. It also comes with Ulead VideoStudio 6.0SE for the actual recording and burning. Installing the DVD creator is pretty simple. You load the driver from the supplied CD and then plug the unit into an available USB port. Once you confirm that the device is installed you then install VideoStudio. This all takes about 15 minutes, so it's a fairly painless setup. Connecting to a VCR will require cables for audio so bear that in mind. I don't usually harp on system requirements but in this case I feel it's necessary. Belkin recommends a Pentium 4/1GHz class processor, 128MB of RAM and a USB 2.0 port. Kids, they aren't kidding here. I tried the DVD Creator on a Pentium III/1GHz with 512MB RAM. While the recording worked, the video remained jerky and out of sync with the audio. I worked with a couple of very helpful folks from both Belkin and Ulead's tech support but nothing we tried could resolve the problem. Since SWMBO* gave me a rather disparaging look when I tried to convince her I needed to upgrade yet again, I had to go to a buddy's house to test the unit on a P4 class box. Once on a recommended PC, the unit worked and I was able to make decent recordings from VHS tapes. Since this friend also has a camcorder we tried that and it also worked. As to the Ulead software it was OK but it took me a while to figure out the navigation. The manual is included on the CD but hey, who reads manuals? I much prefer banging my head against the monitor and griping about weird software, don't you? Also, while the SE edition gives you the basic functionality to create VCDs, MPEGs, etc., like most SE editions you will run into a desire to purchase the full product to do serious stuff. But the SE product is pretty full featured nonetheless and for most home users will be more than adequate. Finally, while I can recommend the DVD Creator, I'd like to add a few suggestions. First, get more RAM. If you're running Win2k or XP with only 128MB then you already know you need to do this. Bump your system up to 512MB. It's well worth it and you'll be pleased with the overall results both with DVD Creator and your system as a whole. Second, make sure you have USB 2.0 ports. The USB 1.0 ports just can't push the data through fast enough. I also recommend that you shut down any other running program or unnecessary process when you are recording. 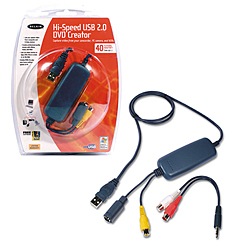 Let the DVD Creator and VideoStudio have all the resources your system can offer.